ATVs are popular among youth and adults for recreation and for utility use. They can be useful for work and fun to ride, but they can also be dangerous if the rider doesn’t operate the ATV safely. Understanding the right way to safely ride the right-sized ATV for you is important before you ride. 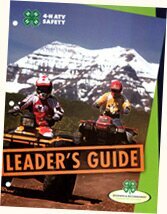 This website is a place where you can learn about ATVs, watch videos about ATVs, find out what size ATV you should ride, and play games and take quizzes to help you find out how much you know about ATV safety. In a forgotten land the minions of evil have returned once again. Ride your ATV through mysterious locations and defeat the horrible monsters to free the town from their evil grasp! Through a grant provided by National 4-H Council and the ATV Safety Institute, 4-H staff are becoming ASI ATV Safety instructors and are teaching the 4-hour hands-on RiderCourse. Check out their news video. Tennessee 4-H Youth Development Program is partnering with the The Monroe Carell Jr. Children's Hospital at Vanderbilt to promote ATV safety. IRVINE, Calif., June 1, 2012 – With the busy summer riding season upon us, the ATV Safety Institute, the Right Rider Access Fund and the Motorcycle Safety Foundation DirtBike School encourage kids to enter the “Do the Ride Thing” Video Contest. The contest, in its third year, runs June 1 to August 15, 2012 and offers 19 prizes totaling $8,500. Students ages 6 to 18 may enter. The winning videos will be used as public service announcements (PSAs).